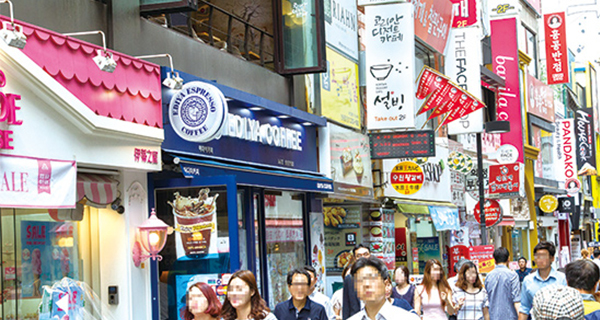 Franchise businesses in South Korea reported a subdued growth in sales in 2017 despite the jump in the number of franchisees, suggesting congested and saturated market. According to 2017 franchise industry data released by the Ministry of Trade, Industry and Energy, sales of franchise headquarters and their stores rose 2.7 percent year on year to 119.7 trillion won ($104.7 billion) in 2017. The growth pace in sales rapidly slowed down from 7.9 percent in 2014 and 17.1 percent in 2015 to 0.6 percent in 2016 and 2.7 percent in 2017. By sector, sales of wholesale or retail franchise stores such as convenience stores reached 66.8 trillion won, taking up the largest 56 percent of total sales, followed by restaurants with 43.4 trillion won (36 percent), and service sector 9.6 trillion won (8 percent). There were 4,631 franchise headquarters in 2017, up 8.5 percent from a year ago, and 5,741 franchise brands, up 8.9 percent, data showed. The number of franchisee stores rose 5.2 percent to 248,000 during the cited period. The average sales of each franchise headquarter was 14.4 billion won in 2017, down 7.1 percent from a year earlier, while that of franchise store remained unchanged at 280 million won. Revenue for franchise headquarters came mainly from distribution margins (81 percent) and royalty fees (11 percent). Franchise businesses employed 1.256 million workers in 2017, up 11 percent from a year ago, taking up 4.5 percent of the country’s economically active population. By sector, restaurants hired 600,000 workers, accounting for 48 percent of the total, followed by service sector with 340,000 workers and wholesale and retail sector with 310,000 workers. By business size, 3,518 franchise headquarters and stores were small- and mid-size companies, accounting for 92.4 percent of the total, 27 big companies (0.7 percent), and 101 mid-size companies (2.7 percent). Big companies and mid-size companies, however, took up 70.4 percent of total sales, 47.7 percent of jobs, and 44.2 percent of the number of franchise stores. Twenty five percent of franchise stores were located in Gyeonggi Province, 20 percent in Seoul, and 7 percent in South Gyeongsang Province. Data also showed that 7.6 percent of total franchise headquarters – about 350 companies – had experience making inroads into overseas markets while 12.3 percent had plans to do so in the future. By sector, restaurants were most eager in overseas expansion with coffee business accounting for 16.8 percent of the total, chicken stores 16.2 percent, and Korean food restaurants 15.8 percent. They entered China (52 percent), the United States (20 percent), Malaysia (13.6 percent), and the Philippines (11.8 percent). Franchisees experienced difficulties due to a rise in labor cost and increased competition. They demanded more business security through restrictions in new entries and fairer business practice from franchise headquarters, the ministry said. Most of franchise businesses said their sales over a year period remained similar (63 percent) or declined (34 percent), with their average annual return at 21 percent.